Any current or new players are welcome to register for the Tag Rugby program which begins Monday, January 7 and runs for 6 weeks. We will be playing tag rugby at the Brookfield Indoor Soccer Complex from 3:30-5:00 with each team playing a half-hour game per week. All the details are on the side of the blog under "Flag Rugby" -- you can email me directly to register or get registration papers. Registration or email confirmation deadline is Friday, December 21, 2007. Most Improved Back: Beth F.
Rugger of the year: Kelly R.
Congratulations to all the award winners. The officers indicated that there were a lot of close races. I think each of you should be proud of the recognition you recieve from your fellow-players. For those of you who couldn't make the end of season party, perhaps the officers will post the other awards list for everyone's enjoyment. So, it's the off-season, now what? Players -- it is the off-season -- it's a time for everyone to enjoy all those other activities and commitments that life brings. But if you miss Rugby or just need something to do, take a look at the USA Rugby website and click on the "Fit to Play" link. This will lead you to lists of pre-season and off-season work-out sessions including circuit training and other recommended workouts. If you are not involved in another sport, find a work-out partner(s) and try to keep yourself active. Following one of the USA Rugby conditioning plans is a great way to challenge yourself and improve your fitness. Working out off season will improve the quality of your play, improve the team as a whole and lead to good habits for healthy living (it's not all about rugby). The Wisconsin U19 Blog reported this story (Wisconsin U19 Girls Rugby: Our First Alumna Eagle!) about Kati McCormick being selected for the U.S. National team, the Eagles, on thier tour of England this December. While she is not a Brookfield alumna, I wanted the Brookfield players to see that local girls can make good. Not all players have the desire to play at that level, but if this is a goal for you, playing in the Wisconsin U19 league is a great place to start. Hopefully some day our club will have alumnae Eagles of our own. Please check your emails whether it be through the gmail group or the yahoo group. Ballots are out and they need to be back to either Liza or Kelly Robinson by Thursday (Preferably Wednesday). Sorry for the short notice, but thats how we do things! Awards will be announced at Kelly F's end of the season party on Friday. Don't forget to bring food to that, we don't want them having to supply everything!!! Also let me know if anyone needs to work out a carpool type of thing. The Wisconsin U19 Girls Rugby blog has a complete list and picture of the All Tournament Team for anyone who is interested. Here is the announcement from Kelly F. regarding our end of season social. Contact an officer or Kelly F. if you have questions about the details. (I deleted all the personal contact information, e.g. address, phone number, etc....). We earned 5th place with a stunning victory over Kettle Moraine, 40-10. I have been really neglectful in not writing down who scored each match -- so I won't try to recap the tries for fear of leaving people out --- the more important fact is that we played with wonderful support. We had players in position to receive passes and ruck whenever necessary. So in the end, we scored 6 tries and 5 conversion kicks. It was a nice way to end the season with a big win over a quality opponent. I am especially proud that, despite the fact that KM scored early, we did not let their quick score deter us from playing our game, playing with determination, and coming back to a strong win. Moreover, we spent a lot of time defending within 22 meters of our own goal line and we were consistently able to withstand the pressure, get out of trouble and return to scoring position. Playing like you did on Sunday took a lot of heart and I am incredibly proud of the team. 3. Dana A. -- sophomore, Full-Back. Each of these players will receive a medal for being named to the 2007 WI Girls Rugby All Tournament Team. Congratulations! (I have your medals). Finally, don't forget to check out the Journal Sentinel story. All matches will be played at Nagawaukee Park in Delafield. The final spots depend upon the results of matches (DS v. Muskego and CMH v. Vernon). We play at Noon on Sunday. All players (and your coach) should be there at 11:00 a.m. to warm-up. Following our match, I encourage all the players to stick around and cheer for your favorite competitor in the final two matches. It should be a great day of rugby. Hopefully the weather will cooperate. Also, if you volunteered to help-out at the final, please be flexible and simply lend a hand where needed. I do not have additional information yet, but my understanding is that they will need help staffing the concession stand during the day. Even though the finals weekend is hosted by Kettle Moraine, the event is for and by the whole of Wisconsin's girls rugby, so let's try and be as supportive as we can of this first attempt at an organized finals weekend. The Journal Sentinel carried this article about about the traditional high school sport carbo-cram. The article prominently features the high school rugby tradition of post-match hospitality. I thought it might interest everyone. (water, Gatoaid, etc). I will also bring bowls and forks. Condiments like Cheese, Sour Cream, Onions, Etc. Let me know if I forgot anything. This sounds like a good idea to me. Please email the list-serv, Steve or me to follow-up on the other items. As always, thank you for everyone's efforts. We will need to arrange the post-match food for this weekend. More information from the officers to follow. The fourth quarter final (DS v. KM) will be played this afternoon. Below is a map which takes you from Bluemound Rd. in Brookfield to Minooka Park which is located just of of County Rd. Y in Waukesha. This is a county park, so there is an admission charge per card load. I think it is around $5. This is the same field that the Bruisers played some of our home games on last spring. Kick-off is at 1:30. The Team should be on the pitch, ready to warm up at 12:30. Let's get ready for a great weekend of rugby! Go Bruisers. This weekend we play in the state quarter finals against CMH. The game is on Sunday October 14, 2007 at 1:30 at Minooka Park, in Waukesha. Next weekend our opponent and game time will depend on whether we win or lose this weekend. We will either be playing in the semi-final match against the winner of Vernon v. Northshore or the consolation match against the loser of the match. All matches on the weekend of the finals will be played at Nagawaukee Park in Delafield on Sunday, October 28, 2007. Our match time will depend upon our results in the next two weeks. The higher our ranking going into the 28th, the later we play on Sunday. Game times will likely range between 10:00 a.m. and 3:00 p.m.
Sunday's match was an all-out battle for 1st place in pool-B. The Bruiser's drew first blood with a try by senior flanker Kelly R. three minutes into the first half. The Bruisers kept up the offensive pressure remaining in scoring territory for much of the first 20 minutes. However, Vernon broke through to score its first try 21 minutes into the first half to tie the score. The lead continued to change hands 4 times in the final ten minutes of the half as both Brookfield and Vernon alternated scoring tries to have a final half time score of 15 to 17 in favor of Vernon. The additional tries were scored by Elizabeth P. and a push-over try by the Forwards from a line-out. In the opening minutes of the second half, the lead again changes hands twice with Brookfield scoring a try which was answered by Vernon. Despite the Bruiser's outstanding performance, the final score was 20-36 in favor of Vernon. The Bruisers lived up to their name with outstanding efforts from all the players. 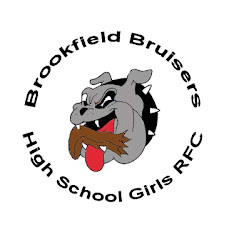 For the record book, Brookfield became the first team to score a bonus point for scoring 4 or more tries as the losing side. It was a well deserved bonus point. Now it's on to the state Quarterfinals round! There will be no practice today (Monday October 8, 2007). Each player should take a 30 minute run on their own this afternoon. See you all on Wed. and Thurs. for our normal practice (4:00 p.m. to 6:00 p.m.) at Brookfield Christian School. Pool A: (1) DS (20pts) (2) CMH ( 14 pts. ); (3) Muskego (10 pts. ); (4) NS (6 pts.) (5) KM ( 0 pts). Pool B: (1) Vernon (15pts. ); (2)Oak Creek (9 pts.). (3) Brookfield (7 pts) (4) FDL (0 pts.). These are the final standings going into the 8-team play-off format. KM has qualified as the #4 seed in Pool B. Pool A: (1) DS (15pts) (2) Muskego (10 pts. ); (3) CMH ( 9 pts. ); (3) NS (6 pts.) (4) (5) KM ( 0 pts). This friday is a black out for East girls. Central has spirit week, but make sure you let everyone know that sunday will be a black out. Also kelly and lucy agreed to make signs and go on announcements so make sure you guys get that done. Beth has signs for East, and Perry and I will take care of announcements at our school. Game is at 1:30 on sunday at Brookfield Christian. We also need to talk about what we want from the fundraising money. We'll talk more at practice. Sorry it's taking so long to figure things out. If you guys have any questions or concerns make sure you email either captains or presidents directly and not through the group, because I know they've been stacking up lately. We play Verno, Sunday at 1:30 p.m. at our home pitch (Brookfield Christian). Players should plan on being there, ready to warm up, by 12:30 p.m.
More information will follow about the post-match food. Everyone.... that was a great practice! I appreciate the extra commitment (from players and parents) that it takes to get us all functioning and present in the morning. But that was worth it as we build up to the last game of the regular season. Sunday saw some brilliant play in the first half by the Bruisers as they worked up a 15 point lead in the first half with tries by Cari B., second row, Kaisee W. out-side center, and Dana A. from full-back. The support running was superb and the open field running/tackling was great. However, in the second half, the OC mauled down the field three times, scoring three unanswered tried with two conversions. The Bruisers made several valiant goal line stands to fend off the relentless mauling by Oak Creek, but were unable to keep them from the try line. Late in the second half, the Bruisers bounced back and began to take back control of the game. As time expired, the Bruisers were unable to convert a scrum within 22m of the OC's try-line into a scoring opportunity. The final score was 19-15 in favor of Oak Creek after a very physical and exciting game. This weeks practices are being held at our home field Brookfield Christian. Same time as previously stated. Let anyone and everyone on our team know. Spread the word. Makes some calls. ETC. I know that the morning practices are bit of a hardship. However, making sure we are on-time so that we can get in two good training sessions prior to the weekend's game will be important to our continued success. Here are the week 3 results and standings . Conference A: (1) DS (15pts) (2) NS (6 pts.) (3) Muskego (5 pts. ); (4) CMH ( 4pts.) (5) KM ( 0 pts). Conference B: (1) Vernon (10pts. ); (2) Brookfield (5pts), (3) FDL (0 pts. ); Oak Creek (0 pts.). The location for our game against Oak Creek has changed. We will be playing on a field located behind Oak Creek High School. which is the first stop light after you pass Farm & Fleet. Turn right on Howell going South, until you reach Puetz Ave (3rd stop light). Turn left on Puetz going East. Go past the High School and turn into the parking lot at the back of the School. Field is to the east of the parking lot. On September 30, 2007 we will be playing against Oak Creek. Warm-ups start at 11:00 a.m. I anticipate that we will need to car pool to this event. We should plan on leaving from the Brookfield Square parking lot at 10:20 a.m.
Sunday, the Bruisers defeated Northshore 42-0 in a physical match on our home pitch. In the opening fifteen minutes of play, the Bruisers found themselves defending within our own 22 until senior Kelly R., with excellent support, broke through Northshore's defensive wall, passing off to Emily who scored the opening try of the game. These were followed by a try by Dana and a try by Elizabeth, converted by Dana as the final minute of the first half clicked by. The second half, Brookfield continued to pressure Northshore, retaining possession nearly the entire half, as Brookfield continually applied offensive pressure. The second half saw tries by Elizabeth, Holly, Beth and two tries by Kelly R., making the final score 42-0. Sunday's game was also the initiation for Mari, our newest rookie, who played wing for the short-sided Northshore team. Mari repeatedly stopped the advance of her teammates on the wing with her aggressive tackling skills, earning her the rookie of the game honors. Player of the game honors were won by Caroline whose strong play at number 8 help keep forward momentum on offense. Hey girls, that was a great game today. Everyone played awesome and hit hard. All of the rookies played like veterans! Keep up the good work ladies! Everyone should be a practices, because we still have stuff to work on. Remember that if you need a ride to or from practice, there is always a driver willing to take you. So, lets see everyone at practice and lets beat vernon in two weeks!!! I just wanted to say great attitudes lately and im very proud of everyone, especially all the new people who are awesome... keeep up the great work everyone! NS (1-1) v. Musk (1-1) 5-7 (4 pts. for Musk./1pt. for NS) for losing by less than 7 pts.). Conference A: (1) DS (10pts) (2) NS (6 pts.) (3) Muskego (4pts. ); (4) CMH (0pts.) KM (0pts). Conference B: (1) Brookfield (5pts), Vernon (5pts. ); (2) FDL (0 pts. ); Oak Creek (0 pts.). We play Northshore this coming Sunday at home. Our home field is on the corner of Lilly Rd. and Burliegh at Brookfield Christian School. Kick-off is at 1:30. Players should be at the field at Noon. In addition to our warm-ups, we will need to move some soccer goals before we play. This is our first home game, let's try to have a good turn out. The Bruisers fought their way to a 10-10 tie against DSHA-B on Saturday morning. The Bruiser's two tries came in the first half. Cari, senior lock, powered over the try line at 12 minutes. Within five minutes, the Bruisers scored a second try, this time from the back line when Val, senior inside center, slipped through the DS-B defense to give the Bruisers a 10 point lead. DS struggled to come-back against the pressing defense of the Bruisers but finally punched through a try in the closing minutes of the first half. As the second half rolled on, the Bruisers gave up a final try to the Dashers for a final score of 10-10. While the score was tied in the end, the Bruisers played a great game, dominating the Dashers in terms of both possession and territorial advantage. Beth, junior wing and Holly, junior flanker, both made dramatic break away runs. Lauren, junior prop and player of the match, made outstanding tackles all around the field. Saturday was also the initiation of two rookies, Talia at prop and Rachael at scrum half. Rachael earned our rookie of the match prize taking home the much coveted honor of washing jerseys as a reward for a job well done. We are off to a great start. Last weekend was the season opener for Wisconsin Girls Rugby in the first season of having 2 pools. Pool A consists of DSHA-A side; North Shore; Kettle Moraine; Muskego and Catholic Memorial. Pool B consists of Vernon; Brookfield; Oak Creek; Fond du Lac and DSHA-B. Teams are seated in the pools based on standings from last Fall. The season consists of a 5 week regular season where teams play each team within thier pool and one cross-conference match. Only matches against pool opponents count toward pool rankings. Teams earn 4 points for a win; 2 points for a tie; 1 bonus point for scoring 4 or more tries; and 1 bonus point for losing by less than 7 points. Following the 5 week pool play, teams are slotted into brackets for a 3 week play off, culminating in the state finals on Oct. 28 at Nagawaukee Park in Delafield where all teams will compete for the final state rankings. Conference A: DS and NS are tied for 1st(5pts. each) with a 3 way tie for second (CMH, Musk. and KM).